The key to successful adventures and travel with kids is finding the right gear. 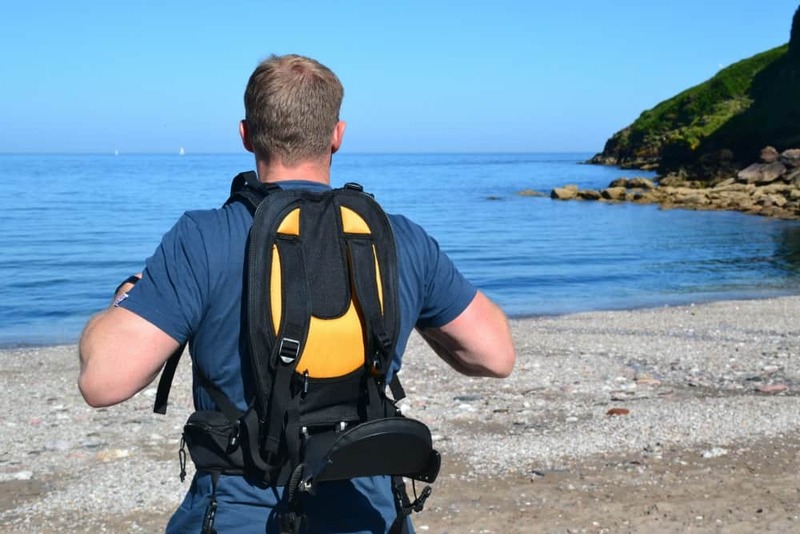 There’s plenty of kit on the market that claims to be a ‘must-have’ for family holidays and, being a sucker for good marketing, I’ve bought quite a few of these gadgets and gizmos. Many of them get tried once or twice and are then discarded because they’re awkward to use, bulky or we found we just didn’t need them. 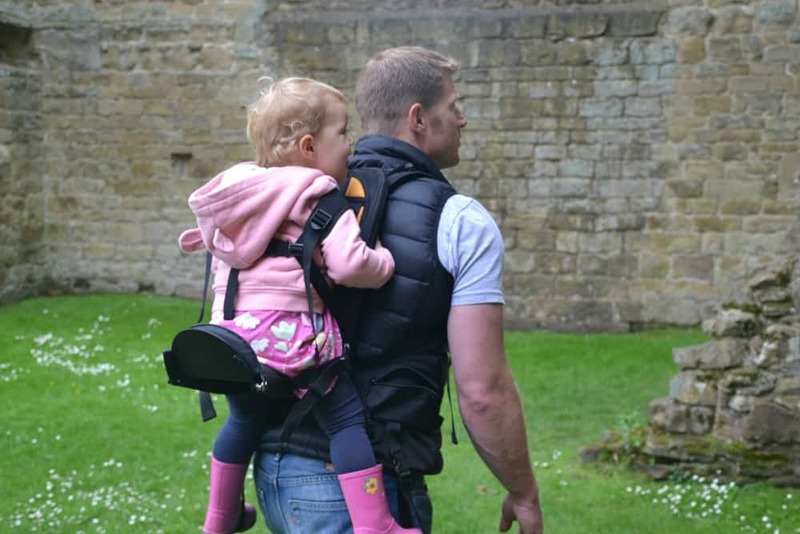 So when the team behind the Freeloader child carrier got in touch to say their carrier was ideal for families who loved to travel and explore, I couldn’t help but think ‘really?’. Read on to see how we got on. What age is the Freeloader child carrier for? We’ve had the same structured back pack-style carrier since Tin Box Tot was six-months-old. We bought it because it claimed to be suitable for children from six-months to about four years. It’s served us well but is by no means perfect. It’s big and weighty. It doesn’t pack down and takes up a lot of room in our car when we’re out and about. I certainly wouldn’t consider taking it on a plane. Most important of all, I haven’t been able to use it for a year now as even with two-year-old Tin Box Baby it’s too heavy for me. So, carrying responsibilities have fallen solely to Mr TB. But how does the Freeloader child carrier compare? This eye catching piece of kit has been designed by parents after our own hearts. They want to explore with their young children but recognise that they do get tired and need a break. Like us, they had become frustrated by the impractical nature of other child carriers, so they decided to have a go at making one themselves. 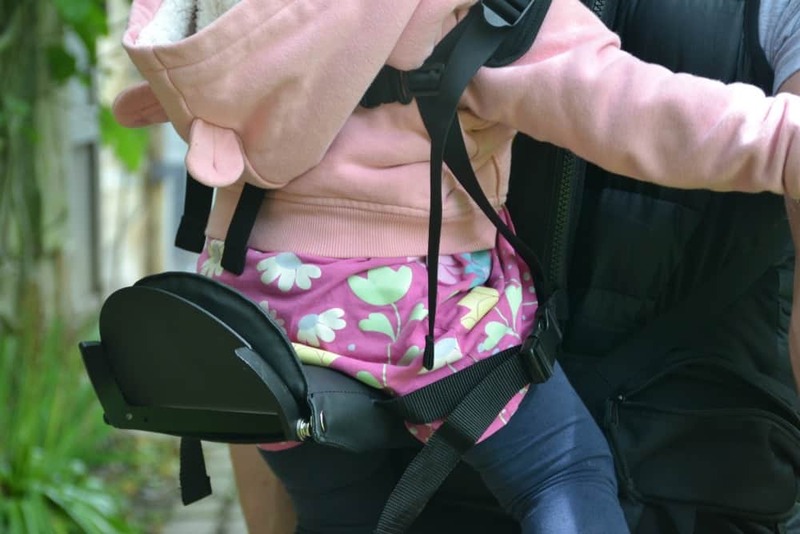 They used their experience in the outdoor gear market to investigate how new technologies being used to make products for adults could be adapted for their child carrier. So what did they come up with? Carrying capacity: 25 to 80 lbs. Our Freeloader arrived in the post just before my solo week in France with the Tin Box girls. I was umming and erring about what to take with me as the prospect of manuavireng a fully laden luggage trolly and minding two pre-school kids did not fill me with joy. If my only option had been to take our old baby/child carrier I wouldn’t have even considered it. But the Freeloader was a whole different proposition. It was light, compact and hid itself neatly inside our car seat travel bag. Had Mr TB been with me to carry our change bag containing all important airborne kiddie entertainment, snacks and nappies, I would have taken the Freeloader onboard as hand luggage. It was well within the size restrictions for our airline, Flybe (55 x 35 x 20cm including handles and wheels). 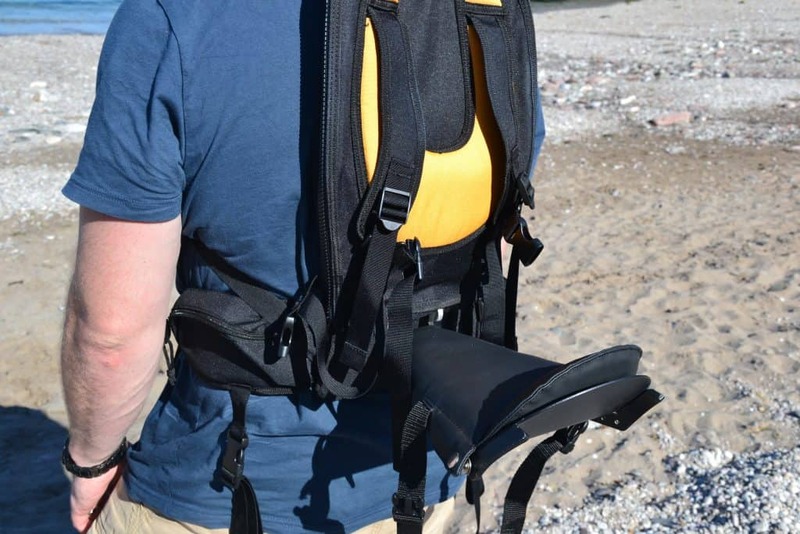 I tested the Freeloader for the first time in France, using the tiny instruction card to quickly get the hang of where the straps and buckles went, and how Tin Box Baby should be positioned. I could even get her on my back on my own, which was something I’ve been unable to do for a year with our old carrier. 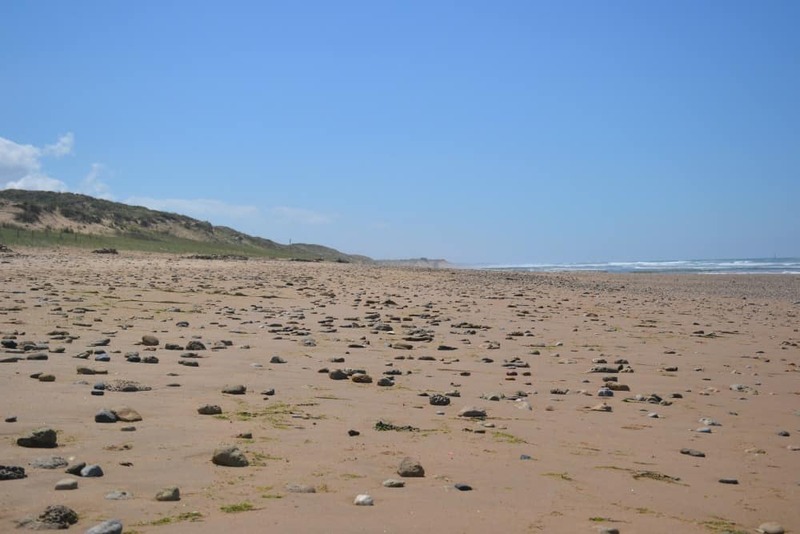 Our trips to the dune-backed beaches of the Vendee region would have been a lot more difficult without this great piece of travel kit as they were inaccessible with a push chair. Back home in the UK Mr Tin Box was able to put the Freeloader through its paces and was equally impressed. We’ve used it several times. 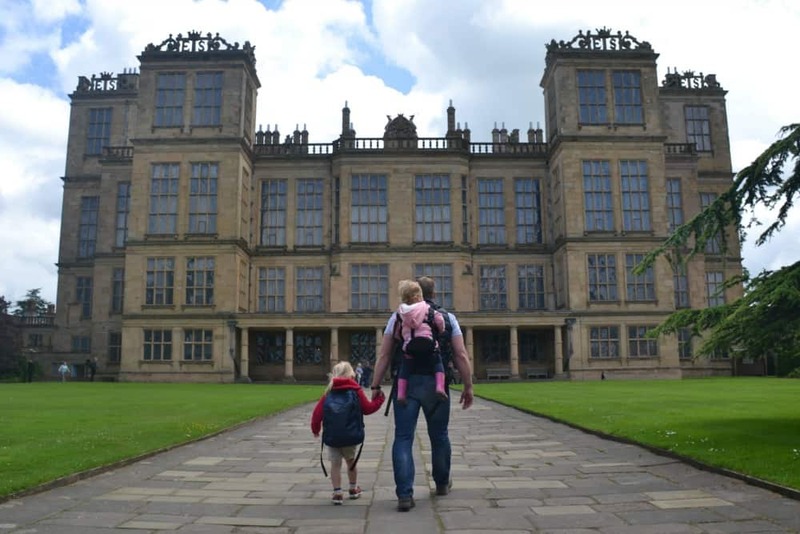 Tin Box Baby was relieved to climb onboard during a trip to Hardwick Hall in Derbyshire after climbing up several flights of stone stairs in the ruined Old Hall. 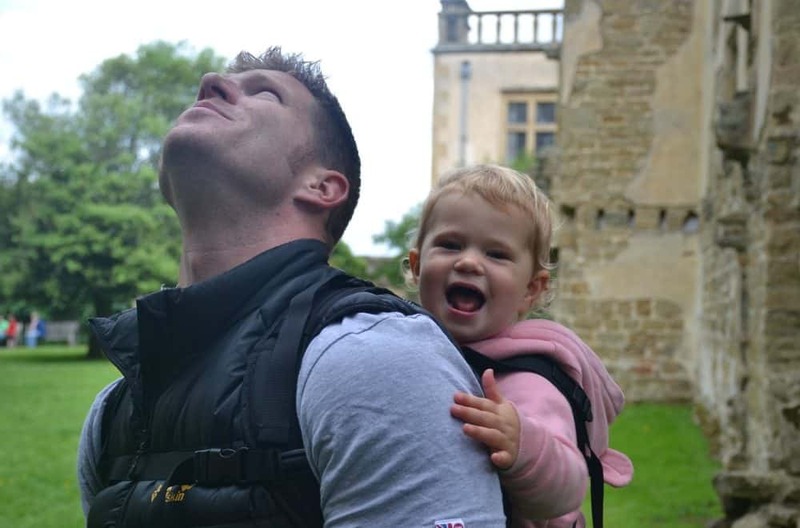 The Freeloader baby carrier was also the perfect mode of transport for Baby when we went in search of the hidden Devon cove of Scabbacombe Sands a couple of weekends ago. It’s this kind of ‘off the beaten track’ adventure that the Freeloader is designed for. Until it’s needed, you hardly notice wearing it. 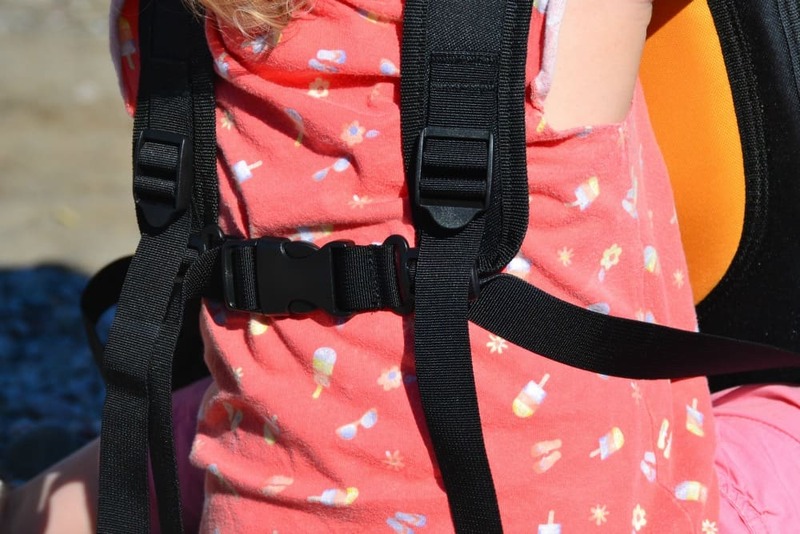 Then when the going gets uneven or your kids’ legs start to give up this child carrier is a quick, easy and comfortable way to give them a lift. We really rate the Freeloader and will be using it a lot during our adventures this summer. The Freeloader comes in three colours and sizes to allow for adults of different builds. It retails at $299, which is roughly £240 at time I published this post, but with the GBP fluctuating check before you buy! Orders can be placed online. The lovely folks at Freeloader have offered me one of their fab child carriers to give away to you my wonderful readers. And they’ll ship anywhere in the world! To enter simply read the T&Cs below and use the Rafflecopter to guide you through submitting your entries. You need to start by logging in with either your Facebook account or an email address (NB: this will be used if you win so make sure it’s a real one). Entries close at 23:55 on Sunday 16 July, 2017. Disclosure: this giveaway and review are a collaboration with Freeloader. All opinions are my own. UK and international entrants welcome. The winner will be sent their prize direct from Freeloader. Supplying an email address within the Rafflecopter widget means the entrant is willing to be added to the Tin Box Traveller mailing list. You are free to unsubscribe at any time. All entries must be received by the advertised closing time at 23:55 on Sunday 16 July, 2017. The winner will be contacted by e-mail, if they do not reply within seven days another winner will be chosen. This would be so useful for our travels! What a fab prize! This would be so useful, my favourite colour is Midnight. I love the coral reef! Midnight – goes with most colours! The Midnight version is my favourite colour. This would be awesome for our family! My parents are adopting a sweet boy & this would be great for helping with mobility! All black is my favorite! We’re in the process of adopting an 8 year old boy with Spina Bifida. My husband is 14 inches taller than I am, so we each need a different size! Here’s hoping we win one! Then we only have to buy one We plan on using it to get him onto The Great Wall! The Freeloader Sundown would be amazing for my twins! The coral reef is my favourite! This would be perfect for my special needs son! It’s hard to do outdoor things together as a family since he can’t walk. The coral reef color is my favorite. Thanks for the opportunity to win one. I love the Midnight colour! Coral Reef is my favourite! Sundown is definitely my favourite. This carrier looks awesome and less bulky than the one we have which we avoided taking to DL Paris but still ended up carrying the kids the old fashioned way in 30degree heat. Tempers were frayed!! Oh no, you definitely need a Freeloader in your traveling lives! Great review! I tend to do for dark colors, black would be my fav. I would choose The Sundown. I love the Sundown colour. This looks like an excellent carrier, I love it in midnight! My favourite colour in the range is Midnight. I think as it would be hubby carrying then it would be the midnight ! I like the Coral Reef. Coral Reef is my favourite. Thanks for a great giveaway. The Sundown looks great to me. What a fab carrier. Love the look of the Freeloader in Coral Reef! I love the Sundown one. Midnight please 🙂 I didn’t ever get a back carrier with no 1 so would be great to use with no 2! The Coral Reef looks fab! The midnight is my fav! Classy. I love the Coral Reef design. These carriers look so comfortable! The yellow sundown colour, it’s nice and bright. Oh wow I would love the black one! I love the Midnight colour as it would be so versatile. The coral reef looks lovely but so do the other colour options, in all honesty I wouldn’t be fussed the least what colour the carrier was if I won, it’s not easy carrying a 3 year old when you have a 5 and a 6 year olds to keep safe too 😮 Thank you for the amazing chance! I love the Freeloader Sundown and I know just the toddler this would be perfect for! Hmmm sundown or coral reef. It’s a thought but coral reef it has to be! This is a fab gizmo I wish I’d known about these sooner! I love the midnight one! Honest question… have you tried any of the leading ergonomic soft structured carriers for toddlers like Tula Toddler or Lillebaby Carryon? They are much lighter (1lb instead of 5lbs!) and are very comfortable for parent and child, while this looks like it holds the child in a sort of awkward position.